One night, Harvard astronomer Alex Parker was camped out at the telescope for a spot of star-gazing, and found himself facing a long, dry period of waiting for the clouds to clear. 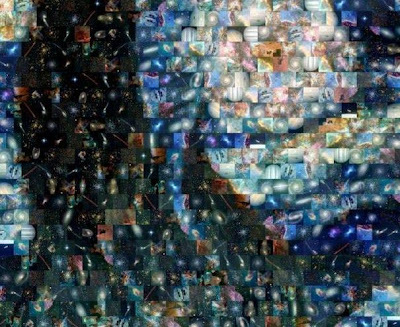 To pass the time, he started playing around with various images from the Hubble Space Telescope, and ended up assembling them into a colorful mosaic. The resulting image? A recreation of Vincent van Gogh's most famous painting, "Starry Night" (above). According to the Finch and Pea blog, "Parker used photo-mosaicing software to assemble the digital collage." He had been thinking about using Hubble images to make a mosaic for awhile, since the telescope's 22nd anniversary was approaching; he just needed the right circumstances to find the time -- a cloudy night.